Printable traffic sign templates make it easy to create props, decorations and craft projects. Stop signs can be created with the printable images using your computer and a few basic craft supplies. Kids can get involved in this craft as well, just for fun or for learning about traffic signs and their meanings. Try making your own stop signs from printable traffic sign templates for your next craft project. Go to the PrintableSigns.net website, read over the terms and conditions, check the box for agreeing to the terms and conditions and click on the "Download Free Version PDF" button to download a stop sign template. Load your printer's feed tray with copy paper and click "print" twice. Cut the stop signs out of the copy paper with your scissors. Hold one of the stop signs onto a sheet of poster board and trace it twice, so that you have two stop sign shapes. Cut the shapes out of the poster board with your scissors. 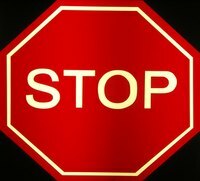 Glue each of the printed stop signs to a poster board shape with white glue to stiffen them. Smooth them on carefully to avoid bubbles and tears. Allow the glue to dry. Lay one of your stop signs, printed side down, on the table. Place a bead of hot glue around the top and sides of the stop sign, leaving the bottom open. Place the other stop sign, printed side up, directly onto the glued one so they are held together all the way around the sign except at the very bottom. Allow the glue to dry. Insert a dowel rod (or even a broomstick) into the open hole at the bottom of the sign. You now have a stop sign that is printed on both sides with a pole to hold it up.